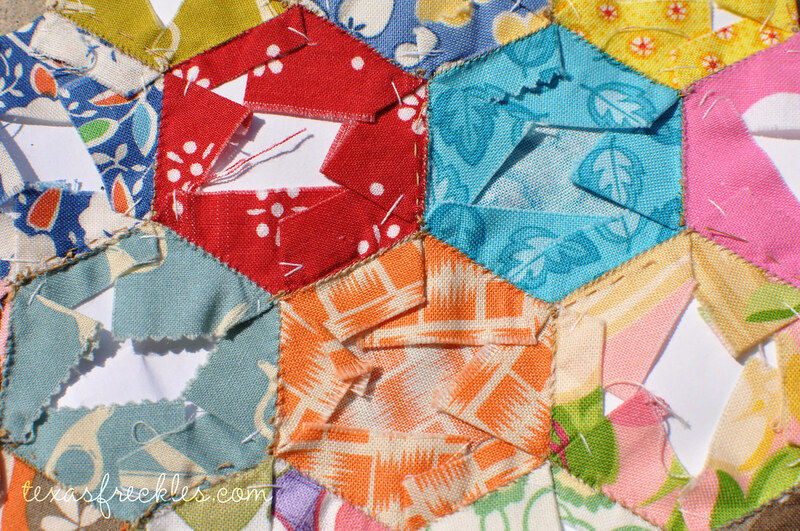 I wanted to share a few thoughts on piecing hexagons this week. Here's my hexagon travel box. I can't remember how long ago I bought this box, but it is from IKEA. It holds more supplies that the bead box and I have everything I need to take my hexagons on to go. I'm using hand quilting thread and a size 9 betweens quilting needle for piecing. The hand quilting thread is heavier and feels more durable, especially since I like to make sure my stitches are really tight. I've also found that I see fewer threads on the front if I use light brown or grey thread. The threads I've been using are above. After trying multiple piecing methods, I'm sticking with the whipstitch. Even though it makes tiny ripples on the front side at the seams, it feels much sturdier than the ladder stitch. I didn't really like using a running stitch. It pulls too much fabric into the seam in my opinion and can cause puckering. Here's the back of that area. I'm trying to keep my whipstitches very small and only grab the very edge of the hexagon. 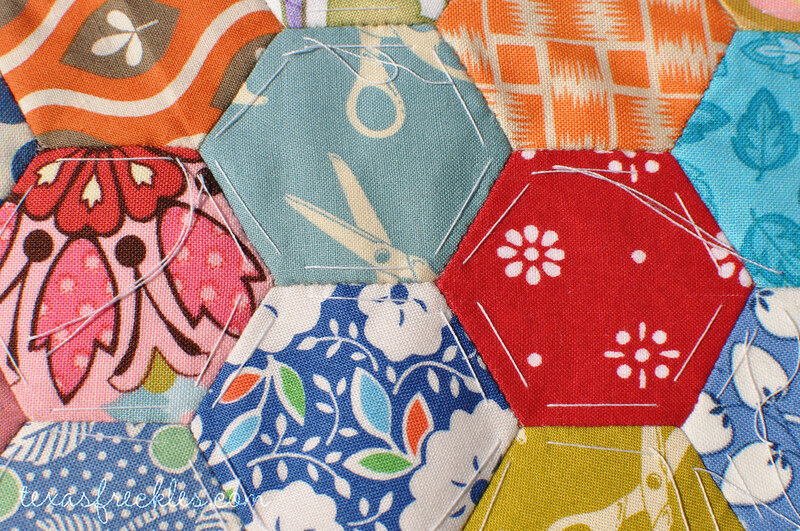 I counted between 15 to 20 stitches per inch on these pieced hexagons. In the photo above, you can see a few of the stitches on the top of that Amy Butler peachy paisley, but since it's brown, it's not too obvious. That's why I like the brown (or grey) as opposed to white for piecing. Even on white fabrics, it seems hidden in the shadows if a few threads end up showing on top. And finally, the back of that area. I make a quilters knot in my thread and then sew the tail down under my whipstitch. At the finishing end, I tie another quilters knot up tightly against the fabric and then weave the thread through a little so the end isn't hanging loose. 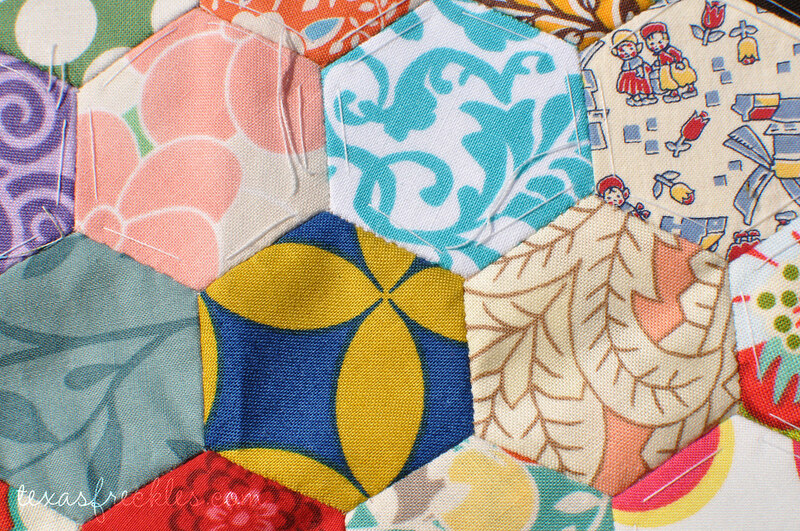 Don't forget to check out all the great hexagons over in the flickr group and add your images! I love seeing all the inspiring photos. There are a couple of discussions going on too. 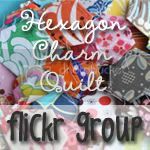 Heather of a la mode fabric started a hexagon flickr group and there are some beautiful and inspiring images there also! 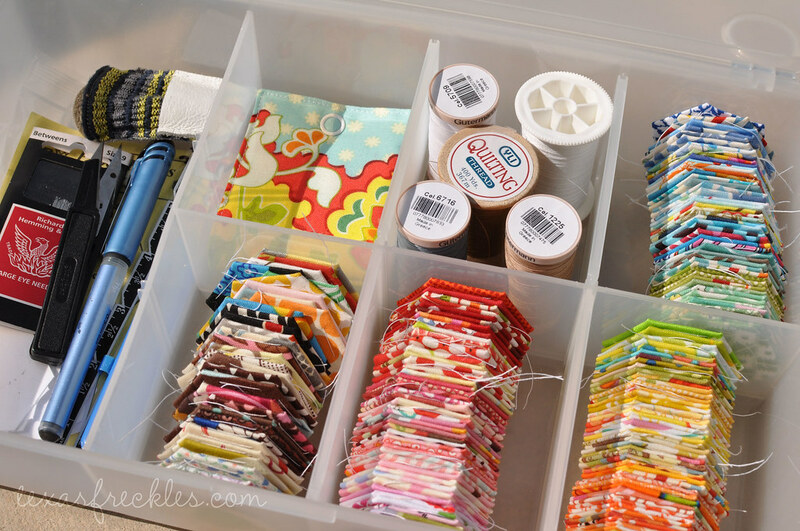 These are great tips for handsewing these together! I am going to save this post for when I get this far. 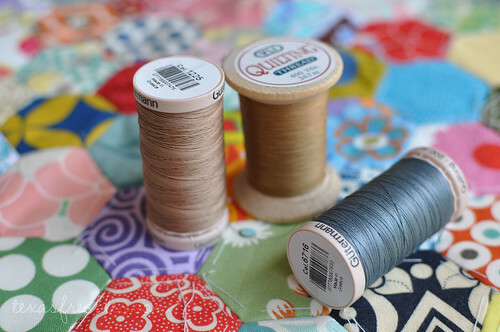 I am also going to pick up some hand quilting thread since I agree that is the way to go. I love that travel box you're keeping your supplies in. You have been making great progress because your project looks fab! Your hand work is awesome, so tight and tiny! Despite really trying hard to make small stitches mine tend toward long especially when I'm watching TV while sewing. Of course, since I'm doing squares I'm using a running stitch which is so much easier. I will concur on using quilting thread for the piecing, I'm using a kind of khaki green and it is great! I've just found your blog, love what I see and have become a "Follower"......your tutorial on the hexagon stitches is very helpful and the thread choices are right on. Hey Melanie, I like the look of that travel box... very cool. I agree - the whipstitch is the best stitch for piecing, and I start and finish the same way you do. 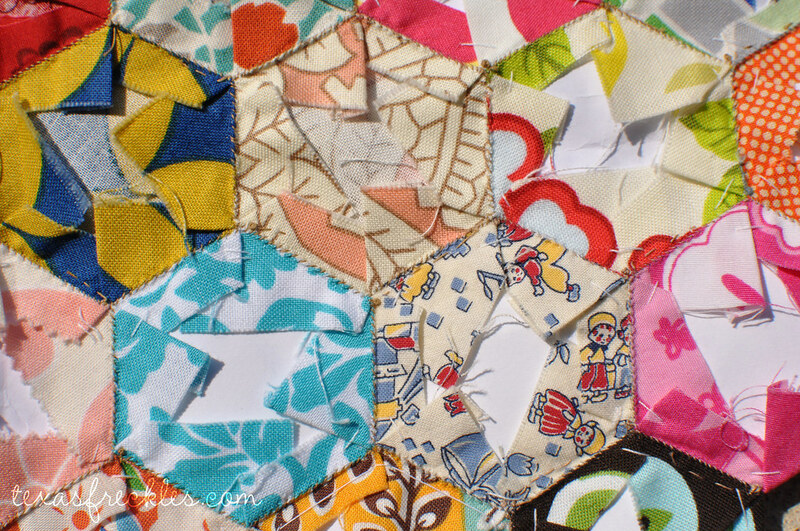 I like the neutral tones for piecing too, but I like a contasting tone thread for tacking the hexagons, so it's easy to see when it comes time to remove it. Also, I leave the paper in til the very last moment to act as a stabiliser for the seams. Also, I always try to attach one hexagon on the straight of grain to one on the bias to stabilise seams. Because it takes so long to piece a hexagon quilt, and you end up handling it quite a bit, stabilisation will keep it looking good by preventing "pulling" along the seams. Great tips! I love the travel box. I would just want to keep them in there and play with them and never sew them together! I love betweens. I use them for all my handsewing. I love how accurate I can be with them. your travel box is so much cuter than mine, but thats what I get for picking one from Lowes! Your hexes are looking beautiful and your stitches are so consistent and neat. I am a bit nervous about the hand-stitching part, but practice makes perfect, right? You are making this seem almost doable to me! After my handsewign stint recently, I am definitely seeing the benefit of a take along hand projects. Oh my. Your handsewing is beautiful! So very impressive. I would NEVER have the patience for this. How could you do this to me?! Today, I have finished cutting out 180 hexagons (from your download) and have a stack of fabric scraps and I've been basting them all day! It's super addictive and I really needed one more love to keep me busy.